The daily grind of patient scheduling, treatments, and documentation doesn't allow for much of an opportunity to peruse the literature to guide future practice decisions. This self-paced online course makes it easy to stay current on the latest research-based practice guidelines. In addition to documentation strategies, treatment tips, and literature synthesis, you'll get video demonstrations of proper techniques — including hand positioning, surface area, strength, and impact. Walk away with advanced knowledge and the skill set to treat atypical pathological findings. Get tips and tricks to alter your own body positioning to become more effective with mobilization. Learn specificity and sensitivity testing for predictable diagnosis (without imaging!). Administer tests and interpret test results with confidence — eliminate unclear or mixed results, plus no more fear that you'll cause further damage to your patient's injury or condition. Communicate with referral sources based on the most up-to-date evidence available. Avoid denials and time consuming reviews with updated documentation strategies for insurance and Medicare approvals. Achieve patients' rehabilitation goals with less pain, improved mobility, and increased strength — avoid surgery when possible. Know when you have exhausted the conservative treatment options and surgery is all that remains. If you are looking for SOLUTIONS and HANDS-ON VIDEO DEMONSTRATIONS, this course is for you! Don't miss the underlying cause of the injury — learn to pick up on the subtle nuances that differentiate injuries. Return to your practice with new skills to put to use immediately. Improve outcomes — register today! Watch the video sessions at your own pace. Earn 11.5+ CE hours from the comfort of your own computer. 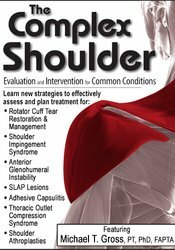 If you are looking for SOLUTIONS to the evaluation and treatment of complex shoulder pathologies, this is the seminar for you. Learn more than just the etiology of these common shoulder complex pathologies. Learn how to interpret clinical tests and recognize the patient's problem quickly. Rapid recognition is imperative not only in developing the appropriate course of action for the patient, but also ensuring the patient has the best chance for a successful rehabilitation. Acquire take-home tips and techniques that will change your clinical practice the very next day! It's no secret - people are harder on their knees than they have ever been. From young athletes to weekend warriors to active seniors, knee injuries are a common occurrence. Knee injury patients across the nation are turning to physical therapists, athletic trainers and strength and conditioning professionals to improve their function and help them rehab from surgical procedures. Ryan August, PT, DPT, MTC, CMP, CSCS, focuses on knee injury and management, and will provide you with renewed confidence in applying current research in science and exercise to active patients with knee pathologies. Ryan will teach you strategies to select the appropriate exercise at the appropriate stage of healing for the patient following an ACL reconstruction. Evidence regarding stress placed on the ACL with specific exercises, healing times and graft selection implication will all be covered in depth. Learn the most recent biomechanical and pathophysiological theories and treatment approaches for sufferers of patella femoral pain and patellar tendinopathies. Advances in meniscal and cartilage care will be covered, as well as the long-term potential progressions to OA and post-operative care for the Total Knee Replacement patient. Ryan will teach you strategies to help guide return to activity or sport, limit injury and re-injury and measuring and proving successful outcomes. 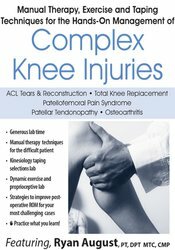 The highlight of the course will be breaks intermixed into the lecture to stop and practice manual techniques, exercises and taping selections for the patients with knee pathologies. Here's what your colleagues have to say about this training. Loved the hands on instruction! Nice to have an ACTIVE practitioner hosting the course. This class was incredibly helpful. You were a fun and engaging presenter. I have many great new treatment ideas! I enjoyed the presenters sense of humor and delivery of material. Very knowledgable. Made the material easy to apply. Great biomechanical basis to explain the content of the course. This guy knows his stuff! Loved the biomechanical and anatomical review. Makes what we do really come to life! Limited Time Offer — Don't Miss Out! Michael T. Gross has 37 years of experience as a licensed physical therapist, specializing in the areas of biomechanics and orthopaedic assessment and treatment. He has maintained a consistent clinical practice for all of these years, currently seeing patients 2 days per week at his faculty practice. He is a professor in the PhD Program in Human Movement Science, and the Doctorate of Physical Therapy (DPT) program in the Division of Physical Therapy at the University of North Carolina at Chapel Hill. Dr. Gross has 70 refereed journal publications in such journals as the Journal of Orthopaedic and Sports Physical Therapy, Physical Therapy, and the Journal of Manual and Manipulative Therapy. He was an Editorial Review Board Member for the Journal of Orthopaedic and Sports Physical Therapy and serves as a reviewer for many other journals. Dr. Gross was awarded the Teaching Excellence Award from the University of North Carolina at Chapel Hill School of Medicine and the Margaret L. Moore Award for Outstanding New Academic Faculty by the American Physical Therapy Association. He also was elected as a Fellow of the American Physical Therapy Association. He has given well over 300 regional, national, and international presentations, which have been highly rated by attendees for knowledge, skill, and humor. Ryan August is currently a physical therapist with The Center of Health and Rehabilitation in Augusta, Maine. His many years of experience include working in an outpatient orthopedic setting with preferred treatment approaches of hands-on care supported by exercise prescription. While completing his doctorate work, he achieved certification in Manual Therapy and as a Certified Mulligan Practitioner. Ryan's ongoing clinical experience and commitment to quality patient care will be evident through his practical presentation of clinical orthopedics. His goal is to have each participate leave his seminars with immediately applicable skills. He is pleased to have this opportunity to share his expertise with you. Financial Ryan August has an employment relationship with Maine General Medical Center. He receives a speaking honorarium from PESI, Inc.
Add the full video downloads to your reference library to reference again and again in the future. Interact and collaborate with other professionals in the online community through chat boards and online forums. Share your reactions, exchange ideas, ask questions, and network with your peers. Complete your CE tests online. Once you pass, you can print your CE certificate online instantly — earn 11.5+ CE hours. Download everything in this course. It's yours to keep forever. Register now for instant access to the online community portal for this series. Login to begin viewing the materials right away. Start interacting with hundreds of other course attendees via chat message boards and community forums. Complete CE tests online when it's convenient for you, to earn up to earn 11.5+ CE hours.